Boar vs Badger Shaving Brush: Which One Should You Buy? There’s a lot of misinformation out there with boar and badger shaving brushes. Some retailers argue you should only buy an expensive silvertip badger shaving brush, while others argue you need nothing more than an affordable boar brush. I believe they’re both wrong. You need the brush that fits you, not the most popular, best reviewed, or cheapest. Any good shaving brush can last your decades, so take the time to consider all the options. I’ve tried dozens of shaving brushes over the years as a reviewer. And as a passionate hobbyist of all things shaving, the brushes I end up loving are both boar and badger. Three of each to be exact. I’m not downplaying the synthetic brushes. They’ve come a long way in the last five years. But for my money, I prefer the natural feel of old school brushes. They mature over time, and you along with them. You will kindle a relationship with a good shaving brush so long as it doesn’t shed. My list of the top three badger and boar brushes are the unique finds. They’re the ones I’ve kept with me long after the review is over. Continue reading to find out which brushes made my list. 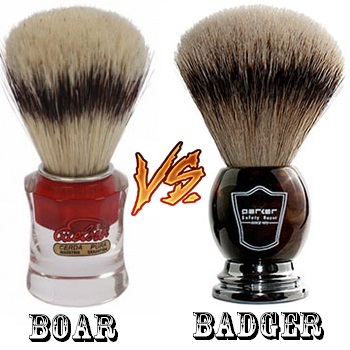 Difference Between Boar and Badger Shaving Brush! Parker Safety Razor opened its doors in 1973, delivering professional shaving supplies to stores in North American and Europe. 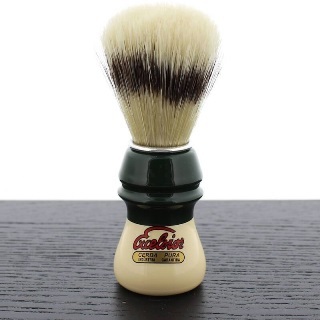 They know shaving, and their silvertip badger shaving brush illustrates that knowledge. Silvertip is the softest grade of badger bristles. If you have sensitive skin, or the brush you have now causes irritation, then you need a silvertip brush. Parker Safety composes this 22mm knot brush with handmade parts. Their craftsmen assemble both the knot and faux horn handle in-house. I like the look of this brush. They’ve balanced the chestnut brown horn color with a silver base. It accents the silvertip bristles nicely. 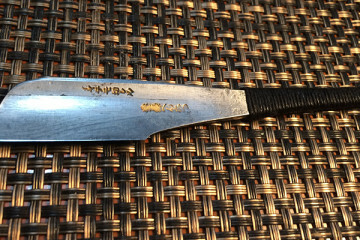 Seasoned shavers argue that silvertip bristles hold the most water. I agree. This brush retains a surprising amount of water because of the combination of a long loft and dense, soft bristles. The brush leavens lather quickly. So long as you use a soft soap, it’ll never fail you. I can’t see anyone’s skin reacting poorly to this product. Included with this brush is an acrylic drip stand. It holds the brush securely and ensures that your brush dries evenly. I think Parker Safety Razor could sell this product for two times the price and it’d be worth it. Their forty years in the business show in this product. It’s worth the money, especially considering silvertip brushes usually cost twice as much. Edwin Jagger craft their products in Sheffield, England, a city renown for maintaining the old ways. They pride themselves in crafting handmade goods. 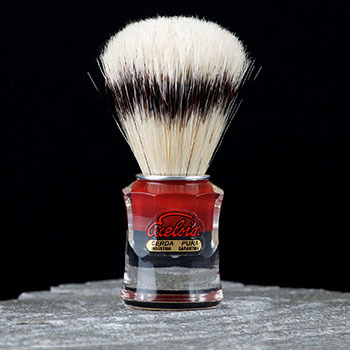 The shaving brush uses a 21mm knot of best quality badger hair. Best hair comes from 20% of the badger’s body and is known to be a great overall product. It’s not as expensive as super badger hair, nor as soft. 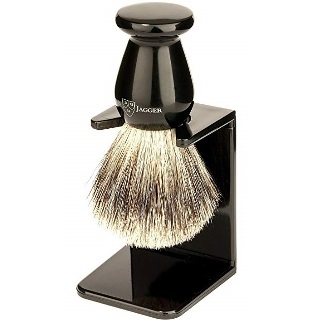 Best badger hair stands out as the most popular choice because it combines what you want from a higher end shaving brush without the extra cost. I’ve found it absorbs a lot of water and creates a rich lather. The brush will need working in, as most brushes do. But nowhere near as long as Boar brushes or pure badger hair products. The bristles are stiff enough to lift troublesome hairs that lay flat on your face. And you may find a few hairs shed the first few days, but the knot itself will last years without constant shedding. With its medium textured, light colored hair, the brush matches the polished, ebony black polyester handle. The handle itself is shorter than some products, but not drastically. There’s plenty to hold on to. But if you have meaty hands keep that in mind. Edwin Jagger included a drip stand with the brush. It’s easy to clean, made of the same polished black polyester as the brush handle, and will look classy in any classy consumer’s bathroom. Overall, this product hits a great price point for value. If you’re looking for a higher tier experience, or a brush that retains lots of water and lathers well, this is a great option. Art of Shaving started in New York City with one store. Today, they run a popular chain of boutique grooming shops and sell an extensive list of products online. Shaving brushes are their specialty. They make this black badger brush knot with pure badger hair. Pure grade badger hair is the lowest tier you can buy, but that doesn’t mean it’s not worth considering. You harvest pure badger hair from the belly of the animal. It has long, stiff shafts and feels coarser than best hair or silvertip hair. The coarseness gives the hair a rough tip. It exfoliates more than any other grade of badger hair while still retaining a respectable amount of water compared to a boar brush. If you want to avoid boar hair but still want something stiff, then try this pure black bristle brush from Art of Shaving. The black acrylic handle fits nicely in my hand. It’s larger than many other products on the list. The loft length, however, seems shorter than my other badger brush recommendations. That’s not a bad thing as you have more control compared to a longer loft. No drip stand comes included with the brush. And I’ve only experienced infrequent shedding. If you spend any length of time with shaving supplies, one name you’ll spot again and again is Semogue. They’re a small company out of Portugal that believes a happy master craftsman will make an exceptional product. I can’t agree more. Since Semogue craft both Boar and Badger brushes, I chose their boar brushes to focus on to prove they’re a great option. 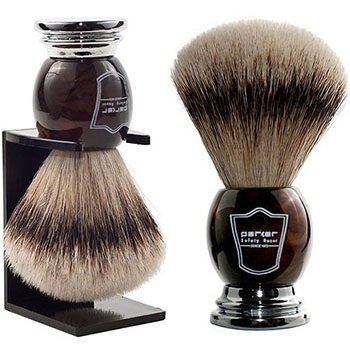 Most customers don’t understand boar shaving brushes. They’re often cheaper and therefore considered inferior by many sellers. I disagree. And the 830 boar bristle brush proves how wrong they are. In my hand this 23mm knot boar bristle brush feels fantastic. From the moment I pick it up I can tell it’s a solid product. The two-tone acrylic handle has a sturdy heft to it. There’s no hollowness to the core like some boar bristle brushes I’ve reviewed. The bristles themselves are longer than average, the loft being 55mm. But what I find the most surprising is the brush’s soft bristles. They’re stiff enough to dig into a hard soap, but soft enough to not scratch my face. A boar bristle brush is difficult to recommend from a first impression alone. Unlike a badger brush, you must work them. Your experience with this brush changes over time, from month to month and year to year. I’ve found my 830 to soften over time. I wasn’t sold on it when I first bought it. Years later, it’s my go-to boar brush. What better praise is there than that? No company on the list has lasted as long as the Italian company Omega. Founded in 1931, they started out solely manufacturing bristles. Today, painters and shavers swear by their brushes. But just because they’ve been around forever doesn’t mean they craft average shaving brushes. Their products stand out because they’re unusual. 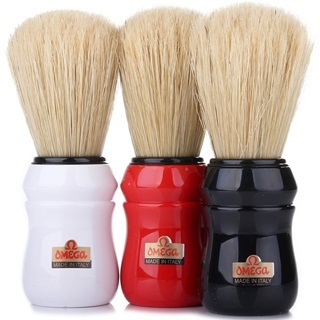 Omega boar brushes are an inch longer and about twice the width of your average shaving brushes. I find the size helps with control. You can lather extremely well with an Omega. I’ve heard the boar bristles smell funky when you first pull the brush out of the box. But I can’t remember the smell because I’ve had mine for years. The acrylic handles ship in three colors: black, white, and red. The knot fits snuggly in the handle. There’s no notable hollowness when you use it. It’s the perfect starter shaving brush. I also recommend it for anyone that needs a second brush for exfoliating because their badger brush doesn’t scrub hard enough. Like all boar bristle brushes, give it twenty to thirty shaves before your final verdict. Over time, the bristles will soften. In a month or two you’ll discover the Omega to be a sleeper hit. I like this family-owned Portuguese company so much that two of their boar bristle brushes made it on my list. If I didn’t sell you on the Semogue 830 because of its price, then consider this cheaper alternative. But don’t assume that the drop in price is a drop in quality. Semogue remains an industry standard because of their tight knots of exceptional bristles. The 1305 sports dyed, black-on-blond bristles that lather great right away. That’s because the dying process begins the break-in period. You won’t need to spend as much time breaking in this brush than its blond-haired relatives. 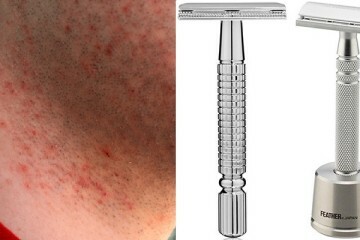 I liked my 1305 from the first shave and loved it by my 15th shave. It breaks in smoothly with no frustrating shaves in between. If you favor hard soaps to lather with, you need a Semogue boar bristle brush. The 1305 lathers a hard soap within a few minutes whereas my silvertip badger brush can often take me at least ten minutes. The brush has lots of backbone. It’s not flimsy or weak, and the 90% top hairs mean its soft and covers lots of surface area. I think the 1305 is the boar brush you buy when you’re considering the move to shaving brushes and lather. It sells you on the experience right away. Sure, it’s not the sleek, all-black brush you’ll get with badger hair. Instead, the handle is wood. It’s painted by hand, cream and hunter green. Their products remind me of the past, the Kodachrome days of American-made and drive-in movie theaters. It’s a trip back in time every time you shave. What more can you ask for than that? Boar brushes must be broken in. Be willing give the brush at least a month time. Don’t expect your boar brush to be the best right out of the box. The boar hairs need to split and soften. Some boar brushes can take a few months, depending on how much you shave. Your experience will change as time goes on. Although obvious to some, know that boar and badger brushes come from different animals. Boar hair is a fancy term for pig hair. It seems like almost all boar bristles are harvested in China, and are a by-product of the meat industry. This is also true for badger bristles. The shaving industry has standardized badger bristles into four different hair types: pure, best, super, and silvertip. The industry bases grades of hair on where it is harvested. Pure badger hair is the coarsest and silvertip the softest. Boar hair, on the other hand, has no rating system. But not all boar hair is the same. Companies choose the hair by testing various types until they find the one that matches their needs. On average, boar hair brushes are cheaper than badger brushes, although some pure badger hair brushes can be cheaper than a boar brush. One advantage of stiffer boar bristles is that they work better with harder lathers because they can dig into the tough surface of the soap. Badger hair brushes retain more water than boar. That means they lather easier. The lather with badger hair also has a silky, creamy texture. If you have sensitive skin, the soft bristles and creamy soap stave off irritation. But for some people, a soft lather may not be what you want. Boar hairs have hooks at the end of them and these hooks lift hair that lies flat on your face. So, if you have missed hairs after shaving, consider a boar bristle brush. Forget about price, both boar and badger bristles are great options. The brushes on my list are all quality products with tight knots that hardly shed. I know because I own them and use them often. Some brands, like the Semogue brand, are passed down from grandfathers to grandchildren. Hair type doesn’t mean a quality product. 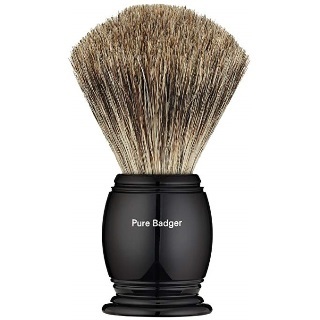 A poorly manufactured silvertip badger bristle brush will shed more than a well made and cheaper boar brush. Hair counts for a third of the product’s overall quality. The handle must be well made, and the assembly thoughtfully designed. Quick production line shaving brushes break and shed. Look for handcrafted brushes. You can own a four hundred dollar shaving brush, but if you don’t lather with a great soap, you’re in for a bad time. Do your research and purchase a quality soap. Buy a shaving cream that lathers, not a gel. In a pinch a gel is fine, but shaving brushes were meant for a rich, fragrant lathering soap. If you’ve never shaved with a shaving brush, try it. Don’t look to be convinced, everyone who writes about shaving brushes already knows they’re great. Buy something on my list today. Any shaving brush is better than no brush, as you can’t lather up a handmade soap without one. Plus, you don’t need a safety razor or straight razor to own a shaving brush. The modern man and his fancy electric razors can enjoy the benefits of these brushes, too. Finding your favorite brush also involves aesthetics, and that rarely comes down to the hair itself. The handle and overall build quality matter, too. Once you narrow down the hair you want in your brush, think about its aesthetics. Don’t worry if it’ll match your bathroom, worry if it’ll match you. A shaving brush, over time, becomes an extension of yourself. With shaving brushes, the important thing to remember is that every brush offers its own experience. You may end up owning two or three (or in my case six). That’s okay, too. 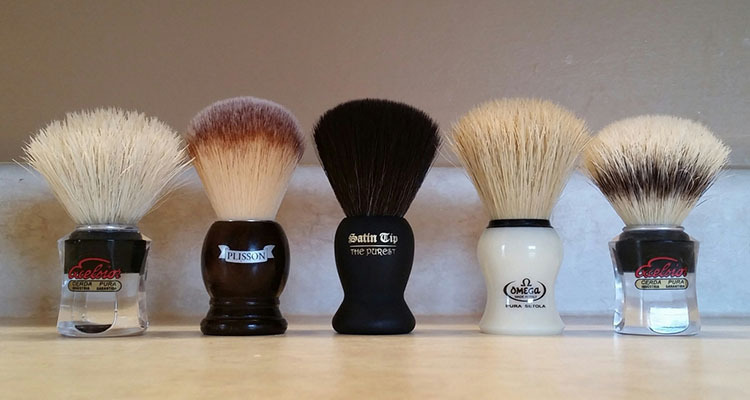 Each shaving brush I own provides a unique experience. My Semogue boar brush exfoliates, and I take my time lathering with it. It’s meditative. I bring it out when I have more time and want a deep scrub or have two-day stubble. I like my Parker Safety Razor badger shaving brush because of its soft bristles. I’ve had it long enough now that the bristles are practically silk. Once it’s full of shaving lather, it’s like a warm pillow. I use it for daily shaving, when my skin is tender because I shaved less than 24 hours ago. Owning two or three brushes isn’t strange. It’s normal. Give one of my top brushes a try. If it wasn’t what you were looking for, try another one. They all have a purpose in your shaving routine. You just have to find out what that purpose is.